FARMING TRUTH IS NOW ON FACEBOOK! Like my page for exclusive content, news in agriculture, and access to giveaways that you will not be able to get anywhere else! 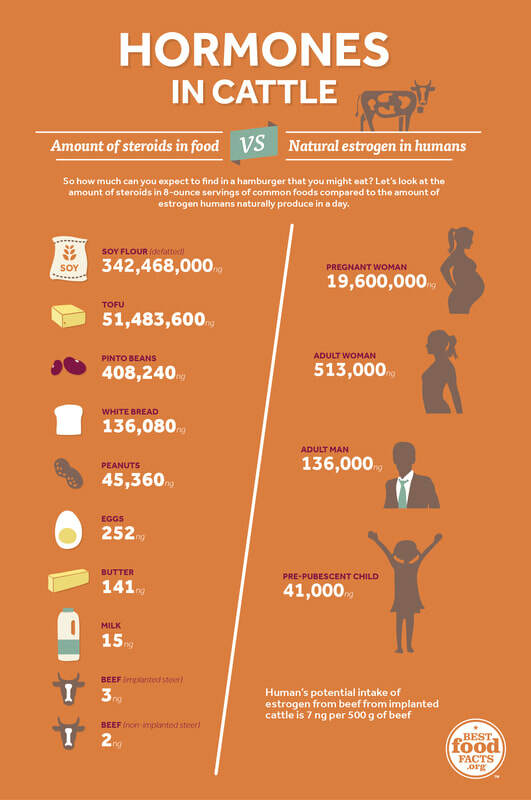 Are There Hormones in Your Meat? The food label “Hormone Free” is illegal because all food products, both plant and animal-based, contain naturally occurring hormones. All poultry and pork is raised without any added hormones. Period. In poultry and pork, the food label “No Hormones Administered” is prohibited unless its followed by the explanation that "Federal regulations prohibit the use of hormones." In beef and milk, the label “No Hormones Administered” does differentiate meat from cattle that were raised without added hormones from non-labeled meat that could or could not have come from an animal that was given growth hormones. Juskevich, Judith C. "Bovine Growth Hormone: Human Food Safety Evaluation." Science249.4971 (1990): 875-84. JSTOR. Hormones and Antimicrobial Residues in Meat. "Toxicological Research. The Korean Society of Toxicology, Dec. 2010. ​ One type of hormone that has received a lot of concern, especially in the vegan community, is that of IGF-1. It is true that consuming cattle products raises your levels of IGF-1, but what a lot of people don’t realize is that the hormone actually has many health benefits, including reducing inflammation, promoting healthy bones, boosting the immune system, delaying aging, and improving our skin. In fact, a deficit of IGF-1 increases the risk of dying from all causes more than an abundance of it. ​ The label, “No Antibiotics Added,” while a different topic entirely, is approved for red meat and poultry products that were raised without the use of antibiotics. However, medicating animals (which is often most easily and efficiently done with antibiotics) actually prevents the even bigger food safety risk of consuming products that came from diseased animals. Just like with hormones, animals must wait a withdrawal period from the time they receive the antibiotic treatment to the time they are slaughtered. When discussing food labels that deal with hormones given to livestock, it’s important to ask the question of why livestock breeders give these animals any hormones in the first place. Many consumers would answer that question: “To make the animals bigger,” and they’re absolutely right. However, not a lot of people realize that administering livestock animals with hormones actually decreases a lot of environmental concerns. Much in the same way as finishing beef cattle with grain (which is to be discussed very soon in this Food Labels Series), giving animals hormones helps them reached the desired slaughter weight (usually 1,250 lbs) faster so that they live shorter lives. This, in turn, decreases the amount of inputs, including feed, fuel used to transport feed, water, and land. It also decreases the amount of time that the animal is emitting methane gas through enteric fermentation, so their carbon footprint is reduced. An Elanco scientific assessment identified using bovine growth hormones as a necessary step to feeding our growing population. Another study conducted by Cornell found that, “one benefit from the use of rbST is that supplemented cows require less feed per unit of milk produced.” As long as we know that we are not putting public health in danger, we should celebrate the innovation of making farming more sustainable through hormone usage. In conclusion, if you truly feel the need to avoid added hormones, then the only products you need to be concerned about are milk beef. Do not buy pork, eggs, or chicken that costs more just because it has the “No Hormones Administered” label… that is a scam!